Thread: Thesys Fastcard IV / PMI / Perhiperal Markeing Inc. I managed to pull the files off the disk. This is "Fast Card IV Utilities 2.0" version. This was right before PMI did the renaming on them. This has the setup utilities, clock, emm driver, etc. Its all here. This is great! The final pieces of the puzzle for this card. I was finally able to get it setup properly, and it WORKS! I've had this card several years now, and I didn't even know if it was functional. Let me know if you get around to scanning the manual, and thanks again. I do have the manual scanned, by that I mean I did a poor mans scan and take photos with my phone, tied them into a PDF. its about 24mb. I'll see if I can get it on bitsavers or something. The setup app is neat, asking you questions then showing you a pictograph of the jumper blocks, its very cool! any news about the manual and the ROM dump? I also added the user manual and software to [here]. Thanks, I wasnt quite sure where to put it! thank you! 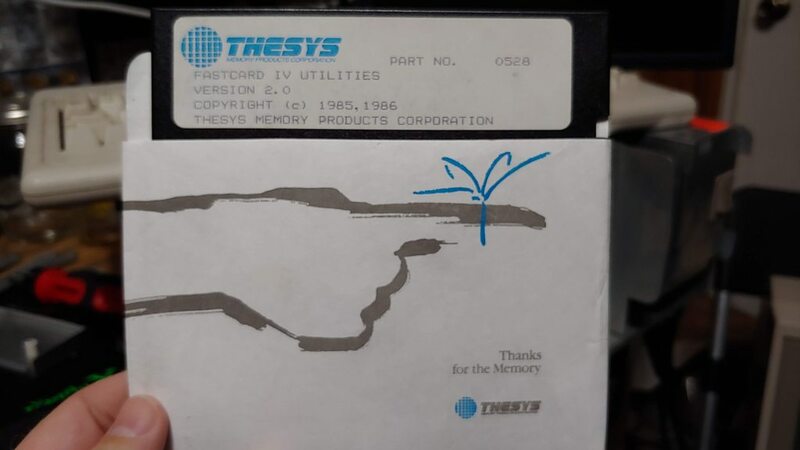 I was able to have my Thesys Fastcard III correctly setup. But still it cannot see all the memory. Probably a bad DRAM chip. By a miracle, I also had an hard disk with the Thesys Fastcard III drivers. if you can recover the FastCard IV bios dump, I would be pleased to get it. Attached "v1.06 03/25/86" EPROM. I suspect its an AM27128 but I also read it as an AM27C256 (same pin count). There is another rom next to it but it is soldered to the board, not sure I want to desolder and socket it, to dump it yet. There is also I believe 9 PAL/GAL's on the board, not sure if trying to dump them would be worth it either, might be fuse locked.